NICCY believes that the Children and Young People’s Strategy should be the framework under which all work by Government in Northern Ireland, in the provision of services for children and young people, is undertaken. The ultimate goal for Government Departments and agencies in the delivery of children’s services should be to improve the wellbeing of children and young people in a manner which ensures the realisation of their rights. NICCY wishes to see a clear commitment in the next PfG to delivery on the statutory obligations detailed in the Children’s Services Co-operation Act (Northern Ireland) 2015 as well as the commitments set out in the Children and Young People’s Strategy for Northern Ireland. NICCY held two events to inform the development of the Children’s Strategy. Click on this link for more information. NICCY has provided advice to the Northern Ireland Executive on its Draft Programme for Government in July 2016 and December 2016. NICCY has provided advice to the NI Government on the next Children and Young People’s Strategy- we expect that it will set out all the actions Government will take to improve the well-being of Children and Young People in NI over the lifetime of the Strategy. What is The Children’s Services Co-operation Act (Northern Ireland) 2015? 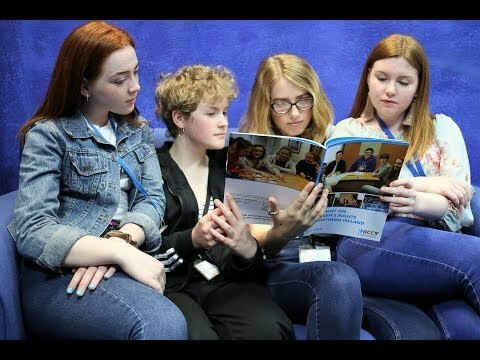 The Children’s Services Co-operation Act (Northern Ireland) 2015 is a significant legislative development which aims to improve the well-being of children and young people in a manner which realises their rights. The obligations under the Act should inform all of the work which Government Departments and agencies undertake to improve the lives of children and young people in Northern Ireland. The Act places a statutory obligation on Government to adopt a Children and Young People’s Strategy. This is in line with the Committee on the Rights of the Child’s General Comment No. 5 on the General Measures of Implementation of the UNCRC which obliges State Parties to produce a ‘national action plan for children’. It places further obligations on Departments / Agencies to co-operate with each other in order to contribute to the improvement of outcomes for children and young people. You can find out more about how NICCY supported the Act here. Eight areas are set out which define the well-being of children and young people and these include ‘living in a society which respects their rights’. It also states that in determining the meaning of well-being for the purposes of this Act, regard is to be had to any relevant provision of the United Nations Convention on the Rights of the Child. The NI Executive’s Children’s and Young People’s Strategy must set out the outcomes it intends should be achieved and the actions to be taken by Northern Ireland Departments, among others, for the purpose of realising those outcomes. The first Strategy must be laid before the Assembly before the end of the 12 month period beginning on the day the Act received Royal Assent, which was the 9th December 2015.
how the well-being of children and young people has improved. any ways in which the Children and Young People’s Strategy might be revised in order to contribute to those improvements. The Act requires the NI Executive to prepare a report not more than 18 months after the date it adopted the Children and Young People’s Strategy and thereafter at intervals of not more than 3 years. NICCY wishes to see all Government Departments and agencies who are involved in the delivery of children’s services carrying out ongoing transparent monitoring on its work within the statutory monitoring context required by the Children’s Services Co-operation Act (Northern Ireland) 2015. This will make the monitoring requirements of the Act easier to comply with on an ongoing basis and should impact on how Government Departments focus their work, with a clear emphasis on children’s rights, with the child at the centre of delivery of children’s services and co-operation and best use of resources as fundamental guiding considerations. To address breaches of children’s rights in Northern Ireland in many instances, will require a cross-departmental and cross-agency approach. NICCY is hopeful that the statutory obligation on Government Departments and agencies through the Children’s Services Co-operation Act (Northern Ireland) 2015 to co-operate in the provision of children’s services will go some way to ensuring that deeper, societal issues which impact on the ability of all children to develop to their maximum potential will be more fully addressed. NICCY strongly recommends clear, transparent and regular monitoring of the commitments in the next PfG clearly linked to the Children’s Strategy high level outcomes and the legislative requirements of the Children’s Services Co-operation Act (Northern Ireland) 2015. We wish to see this monitoring being carried out on an ongoing basis as this should aid Government Departments and agencies in meeting their requirements under the Act in terms of monitoring and reporting and also allows for clear lines of accountability and transparency as required of public office holders and those engaged in the delivery of public services. We also wish to see the statutory duty to co-operate allowing for cross–departmental and cross-agency PfG targets setting, similarly rigorously monitored, where these are required to improve the lives of all children and young people in Northern Ireland.